PT Bank BNI Syariah - BNI Syariah is a reputable financial services company in Indonesia with core business competencies in sharia commercial banking industry. Based in Jakarta, BNI Shariah offers a full-range of general banking services based on Islamic principles with financing business segments on commercial business, consumer and retail business, micro business, treasury and international business. 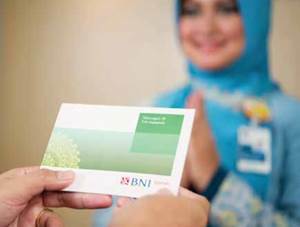 BNI Syariah is a member of state-owned lender PT Bank Negara Indonesia (Persero) Tbk (BNI Group). At present, BNI Group - the third largest state-owned banks in Indonesia - holds 99.99% shares in BNI Syariah. Other 0.1% remaining shares was owned by PT BNI Life Insurance, a reputable insurance company in Indonesia which majority owned by BNI Group. BNI Syariah's head office is registered at Gedung Tempo Pavilion 1 Jl HR Rasuna Said Kav 10-11, Lt 3-6. Jakarta 12950. Bank BNI offer services through 67 branch offices, 165 sub branch offices, 17 cash offices, 8 functional offices, 22 mobile services vehicles, 20 payment points, 202 ATM BNISyariah units, and 1500 outlets spread in all over Indonesia. In term of financial performance, BNI Syariah has recorded a positive financial performance in 2016. According to information found in PT Bank BNI Syariah Annual Report 2016 as cited by JobsCDC.com, BNISYariah booked total income of Rp 277 billion in 2016. This number is up 32.7% year-on-year (YOY) from Rp 229 billion in 2015. For total assets, BNI Syariah recorded growth by 23.01% in 2016 to become Rp 28,314 billion. BNI Syariah's total assets in 2015 worth of Rp 23,018 billion. Minimum Associate Degree/D3 (accredited university) with minimum GPA of 3.00. Graduated from any field, except Medical Science, Midwifery or Nursing. Strong communication skill and highly motivation. Willing to be placed in Pekanbaru. JobsCDC.com now available on android device. Download now on Google Play here. Please be aware of recruitment fraud. The entire stage of this selection process is free of charge. 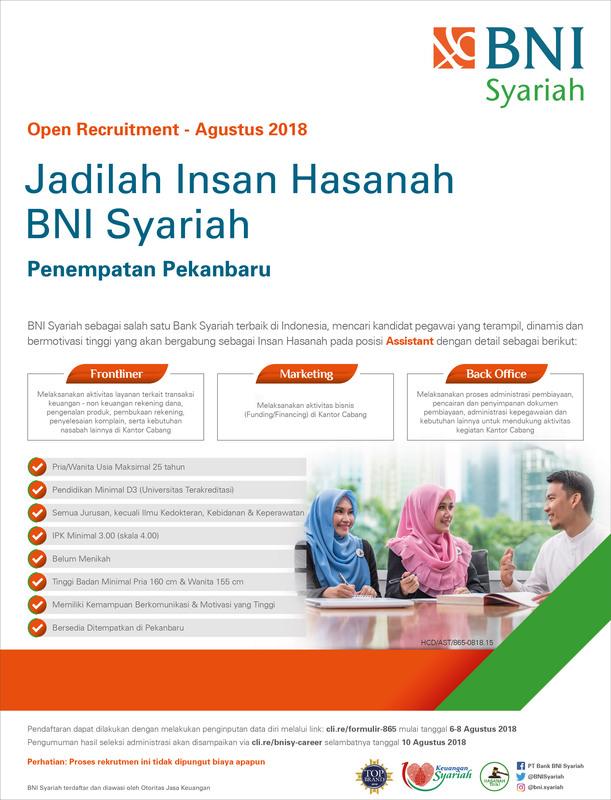 PT Bank BNI Syariah - D3 Fresh Graduate Assistant BNISyariah August 2018 will never ask for fees or upfront payments for any purposes during the recruitment process such as transportation and accommodation.